The plan to connect Kansas City to the Katy Trail began soon after the Katy was envisioned, in the 1980s. Ted Jones, who donated the entire local match required to build the Katy, also made a significant donation towards a future trail connection between the Katy and the Kansas City area at that time. More than a decade spent studying various trail options left the Rock Island railroad corridor--unused since 1980--as the prime option. However, an opportunity to acquire the corridor for trail use was missed in the early 1990s. Ameren became owner of the railroad, with plans to reactivate rail use of the corridor. The opportunity to acquire the 47-mile section of the Rock Island connecting the Katy Trail (at Windsor) to the Kansas City area opened up in 2005, when problems at Ameren's Taum Sauk Reservoir led to a dam breech and disaster that destroyed Johnson Shut-Ins State Park. 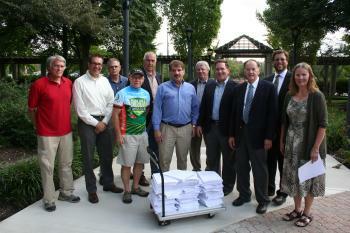 MoBikeFed and MoRIT deliver over 12,000 petition signatures in support of the Rock Island Trail to Ameren. This was just one of several petition initiatives and community support drives that made the Rock Island Trail possible. At that point, many thousands of you signed petitions, sent emails, and called our statewide leaders to support inclusion of the 47-mile Rock Island/Katy Connector Trail in the Taum Sauk Settlement. And the results were good: The settlement that was signed in 2007 included provision for both a trail easement on the 47.5 mile "Katy to KC" section and $18 million in funding to build the trail. The conception was a "rails with trails" connector that would be completed within 3 years. 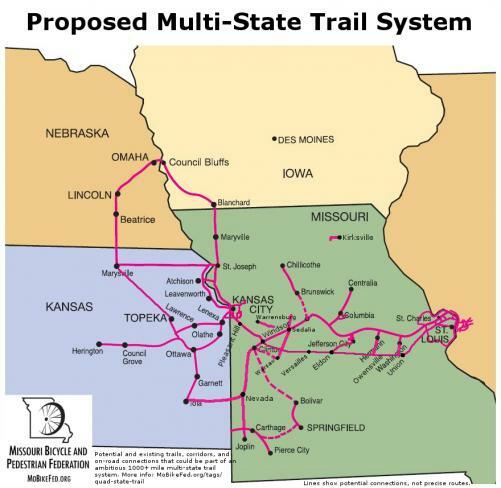 By 2008, Governor Nixon had moved from Attorney General to Governor, and as Missouri State Parks worked with Ameren on the trail plan, a new concept arose: Railbanking of the 47-mile line so that a trail could be build on the railbed, similar to the current Katy Trail. Years of legal and technical work turned this into into reality, as Ameren railbanked first a 6-mile segment of the line, and then the remainder. Since that time, work has been moving forward to salvage rails and equipment along the corridor, and then to build the trail, retrofit bridges, and install trailheads and other amenities. Now the Pleasant Hill-Windsor stretch of Rock Island Trail State Park will be officially opened by Governor Nixon and Missouri State Parks staff. This makes the trail connection between the Katy Trail and the outskirts of the Kansas City metro area, and opens up many new trail possibilities for the state and the region. Jackson County and KCATA have purchased the 17.7-mile segment of the Rock Island corridor between Pleasant Hill and the Truman Sports Complex. 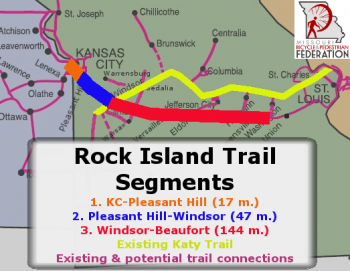 Plans are in the works to build this section of the trail, which will connect the Rock Island to the heart of Kansas City, starting in 2017. Ameren and Missouri State Parks are currently working to salvage rail and equipment on the 144-mile segment of the Rock Island Trail from Windsor to Washington, MO. 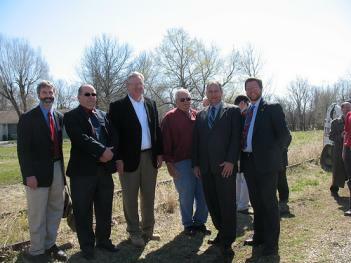 When salvage is complete, the corridor will be turned over to Missouri State Parks. The first mile of this trail will be built in Belle in 2017; completion of the rest may take years to decades. The end result will be a statewide trail loop of interconnected trails, over 500 miles in length, stretching from state line to state line--from the St. Louis Arch to Liberty Memorial in Kansas City. That has been our vision for more than 20 years. We thought this was a vision for our grandchildren and great-grandchildren--so it is amazing to see that vision finally being fulfilled now. Many thanks go to Governor Nixon, Missouri State Parks Director Bill Bryan, the staff of Missouri State Parks, and the many other officials and staff across the state who have worked over the span of decades to make this day possible. The importance of the Missouri Rock Island Trail, Inc (MoRIT), cannot be overstated. MoRIT is the grass-roots organization of communities and people up and down the Rock Island corridor, who have worked tirelessly in support of the trail for many years. As important as MoRIT at the local level has been the work of the Rails-to-Trails Conservancy at the national level. And thanks most of all to all of you--the supporters of trails in Missouri. Because without your ongoing support over the years, none of this would be possible. More about the various Rock Island Trail segments, progress--and a few remaining gaps--on our Rock Island Trail page. 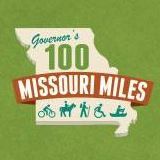 Working to create a world-class bicycle, pedestrian, and trails system across Missouri is one of the four major goals in MoBikeFed's Vision for Bicycling and Walking in Missouri. When we created the first version of our Vision on 2006, so many of our goals seemed impossibly out of reach. Now, ten years later, thanks in large part to the ongoing membership and generous financial support of thousands of members like you, so many of those seemingly impossible goals have become reality.